Intellimas is a data management application developed by Singletree Technologies, a software designed to help enterprises improve the way they manage and utilize data that are stored in spreadsheets. It is built to address the needs of enterprises to replace spreadsheets for better data utilization, analysis, and collaboration. Intellimas can be deployed as an extension to main business software such as ERP, PLM, and CRM or can be set up as a point solution. With its Advanced Entity Engine, users effortlessly retrieve master data from their core systems and include additional user-defined data to perform and accomplish a particular business function. All Intellimas data is stored in a SQL, Oracle, or DB2 database, enabling users to report against it, quickly share it, and securely back it up. Intellimas is for you people who like to do most of your work using spreadsheets but with more functionalities and capabilities conventional spreadsheets provide. Many professionals and business have relied heavily on spreadsheets to perform their functions, from analyzing numbers and figures to making calculations to sharing data for collaboration purposes among other applications. With Intellimas, you get more than just spreadsheets. It is a software that is capable of getting all your spreadsheet data into a single system and integrated into your existing workflows and methodology. The software can easily integrate with legacy ERP and PLM (product lifecycle management) systems, greatly enhancing your efficiencies and productivities. A number of companies now use Intellimas for to power their meetings and functions, such as costing, pricing, data analysis, and more. You can view your data through multiple perspectives, go deep into your data’s history, categorize data based on specific definitions, and more. Because data is processed in real-time, Intellimas helps companies and their people work faster and smarter. Simply put, Intellimas transforms the way you do your tasks and processes. Whether you’re doing compliance audits, sample tracking, product testing, PO and WIP tracking, and capacity planning, Intellimas makes any and every process that you do on or using spreadsheets and make them easier to do in a friendlier, simpler environment. What Problems Will Intellimas Solve? A Sourcing Director of Company A is trying to get her Request for Quotes (RFQ’s) updated from her vendors and internal staff so that they can evaluate expected product margins. This will help the company determine whether to make the product or not. The Director is having an awful time tracking down the RFQ spreadsheets and which version of them is correct. Not only that, but every spreadsheet has a different format and calculations. They have no choice but to go into product meetings not knowing whether they have the most accurate information. They tried on-line spreadsheets for this process but they had to re-key lots of data that already existed in other systems. They tried sharepoint and had issues with the check-in process as well as redundant data issues. Finally they purchased Intellimas. Singletree’s implementation specialist worked with the IT and Business team and determined where to pull the product data and other related elements. Then they reviewed the current process and discussed best practices and baked all of that into the Intellimas entity. Now the Sourcing Director can see where her process stands at a click of a button and drill down into any issues. She can also use the application in meetings, perform what-if analysis, and make buy decisions on-line. She also has an emailed report sent to her every morning to gain visibility into overall margins. Best of all, her staff loves the product because it has the look and feel of a spreadsheet and has exception views, and IT loves it because it has a database, built-in integration, and it establishes a repeatable process. Features used: SQL entity, calculations and rollups, spreadsheet look and feel, exception views, database scheduled reports. Company A’s Supply Chain Director has seen the rapid progress with the RFQ process, due to the Sourcing Director’s decision to use Intellimas. He has a problem with his Work in Process (WIP) Tracking process, where vendors provide the status of their items being produced. He needs this status updated daily for each PO so that he can ensure that customers will ultimately receive their goods on time. He currently uses his enterprise system to manage this process. The vendors log into the enterprise system through a web portal but are finding it difficult to update data in the portal. Their workflow within the portal is to search for a PO, update the dates and other statuses on the screen, and save. Then they start the whole process over again for the next PO, and they could be updating many PO’s in a day. So the Supply Chain Director and the IT team engaged with Singletree to build a WIP Tracking entity which pulls PO data from the enterprise system, combines it with user-defined fields for the vendors to update the status data, and adds some additional functions the users always wanted. Then the data is integrated back to the enterprise system using a web service. Now the vendors can update many PO’s at one time and they love the copy feature. And internal users use their exception views to see when PO tasks are due and alerts to see when PO’s are running late. Features used: SQL entity, service bus integration, spreadsheet look and feel, exception views, alerts, database. Company Z has a need for a Vendor Compliance system. They would like to eliminate their manual process and manage their supplier C-TPAT, social compliance, and various other types of audits. They are currently having a very hard time managing the scheduling and the following up of open compliance issues. They looked at several off the shelf solutions but they don’t meet their requirements. They have a very specific process that needs to be handled and none of the software vendors have this functionality. They reached out to Singletree as they saw on their website that they have a standard solution for Vendor Compliance. They were relieved to determine that the Intellimas Solution can be easily re-configured to align completely with their process and also that the UI looked very similar to their existing spreadsheets. Singletree took their out of the box solution and updated the business logic in the configuration engine based on Company Z’s requirements. Company Z can now handle all of their various audit types in Intellimas. Better yet the system was configured with Company Z’s scheduling logic so this happens automatically with alerts. They can also take advantage of the out of the box audit issue management function to ensure that vendors are always working toward being in 100% compliance. Features used: Out of the box solution, Configuration engine, alerts, spreadsheet look and feel. There are trendy and widely used applications in each software category. But are they necessarily the best fit for your company’s specific needs? A popular software product may have thousands of customers, but does it present what you need? For this reason, do not blindly invest in popular systems. Read at least a few Intellimas reviews and consider the elements that you want in the software such as the fees, main features, available integrations etc. Then, choose a few systems that fit your needs. Try out the free trials of these products, read online opinions, get explanations from the vendor, and do your investigation systematically. This profound homework is sure to aid you choose the best software application for your firm’s unique needs. How Much Does Intellimas Cost? Contact Singletree for their enterprise pricing information and other product details on Intellimas. You can also submit a request for a demo to see if the software is a fit for your business. We realize that when you make a decision to buy Web Collaboration Software it’s important not only to see how experts evaluate it in their reviews, but also to find out if the real people and companies that buy it are actually satisfied with the product. That’s why we’ve created our behavior-based Customer Satisfaction Algorithm™ that gathers customer reviews, comments and Intellimas reviews across a wide range of social media sites. The data is then presented in an easy to digest form showing how many people had positive and negative experience with Intellimas. With that information at hand you should be equipped to make an informed buying decision that you won’t regret. What are Intellimas pricing details? What integrations are available for Intellimas? 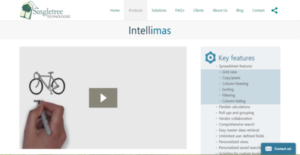 Intellimas can integrate with just about any enterprise system.